Mouthwatering is often an over-used expression when it comes to head to heads in sport but this time the description is more than apt. The Olympic champion at both distances as well as world record holder Bolt up against the dominant sprinter of two years ago, Gay, who won both these events at the previous edition of the World Championships. They have not met this season but that could be a good thing saving it for the biggest stage for athletics this year. Gay, who turns 27 on Aug 9, was not fit at the Olympics, failing even to make the 100m final. Fully fit this time around he should prove to be a worthy opponent for the charismatic 22-year-old Jamaican showman. Another case of the world champion taking on the Olympic titleholder with Wariner desperate to return to the top of the pile after his split from legendary coach Clyde Hart proved to be a disastrous misjudgement which resulted in a distinctly underpar performance by him at Beijing. "I want to show people that last year was just an off year for me, that I didn't run the way I should have," said 25-year-old Wariner. Merritt, 23, was a worthy champion and has continued to improve as Wariner has conceded. "LaShawn's a great competitor," he said. "He's getting better every year. I have to work hard because I know he's working hard." It should be one heck of a battle if Wariner has rediscovered the talent of two years ago. Taylor is one of those rare birds, having twice won Olympic gold in an indivdidal event but not in successive Games, having regained his title last year that he originally won in 2000 after failing to make the final in 2004. The 30-year-old does have a tendency to lose concentration and stumble over hurdles, but clearly had the better of Jackson in last year's final in Beijing where the 26-year-old took the bronze. However, Jackson - world champion in 2005 - has clearly regained top form, beating Taylor into third place at the US trials. Taylor has since failed to run at the Monaco meet but if he retains his focus he will start as a slight favorite. To say that the relay summed up the respective nation's Olympics in the sprints is an understatement as the Americans failed to make the final and then Jamaica rubbed it in by not only taking gold but smashing the world record in the process. Quite apart from blistering speed, the most important thing in the relay is to not drop the baton while delivering it on time, something which the United States have made a bad habit of failing to do in recent championships. 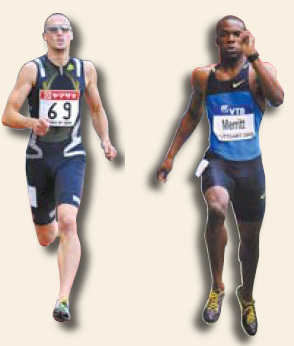 Should both make the final then the world record will surely fall. Richards may have been the world No 1 for the past few years but she has a point to prove - namely that she can keep it together in a major championship final. Patently she did not in last year's Olympic climax as she went out far too fast and paid for it by tying up in the straight as the Briton showed once again she has the big-race mentality by storming past the 24-year-old to take the gold, while the Jamaican-born Richards had to settle for bronze. Once again this year Richards has been the world No 1 packing in the races while Ohuruogu has kept a low profile and been hampered by a hamstring scare. Can the older defending world champion Jepkosgei become only the third female athlete to retain her title after the great Cuban Ana Quirot and Mozambique legend Maria Mutola or finish second best to the runner she herself advised to take up the event last year and the 25-year-old was rewarded for her counsel by being trounced by the 19-year-old in the Olympic final. Jelimo, though, has quickly learnt that there are downs as well as ups as she underwent leg surgery in March and then strained a tendon leading to a modest start to the season. The time seems ripe for her mentor to turn championship tormentor. 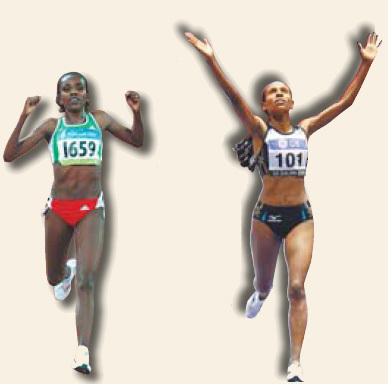 Two of the finest long-distance runners to have ever graced the track, Defar held the initial advantage when she took Olympic gold at Athens in 2004 while her younger rival won bronze. However, since then, 24-year-old Dibaba has had no peers as she has captured four world titles in the 5,000 and 10,000 and did the Olympic double last year with Defar taking bronze in the 5,000m behind her. Defar, 25, still led their head to heads 12-11 going into July and Dibaba suffered a minor injury last month forcing her out of the Oslo Golden League meeting. However, the championship momentum appears to be with Dibaba. - Can Caribbean stars hold on to their crowns?